Today, we officially launched our new website! Part of the launch includes free online training for any government or non-profit animal control or sheltering organization in the Commonwealth. 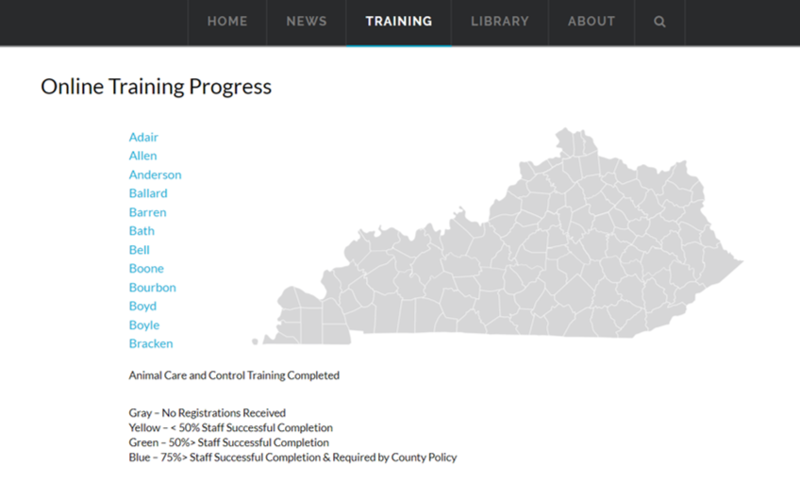 You can track Kentucky’s progress from our training page as we make history in our march to better animal control and sheltering services. Today, the map is gray. Completing basic training will change the color of the map to show your county’s progress. Yellow means the agency has started the training process and less than 50% of their staff successfully completed the courses. Green? 50% or more is complete. The county will turn blue when at least 75% of that agency’s training is complete and they adopt a minimum training policy. It’s a work in progress… Suggestions? Leave us a comment. Hello, now that I have your attention make sure to use the form below and signup to get instant updates from us directly to your email!